January seemed like the longest yet shortest month of my life, how in the hell is it already February?! When we think of February we think of the holiday celebrating love, which usually includes lots and lots of flowers, chocolates, and wine (the best part). While some people truly do love to be dressed in hearts or kisses from head to toe, or stupid cupid, that doesn’t make it right. Today I am sharing some Valentine Day inspired outfits, without it being red, hearts, and love written all over. Are you the girl who has a love/hate relationship with Valentine’s Day? Don’t worry, me too. 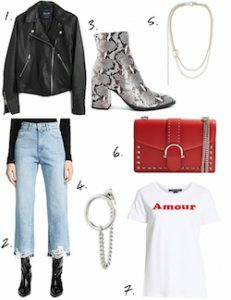 That’s why we throw together a little leather, pop’s of red, and distressed denim to be the casual edgy girl for V-Day. Each of these pieces are extremely versatile, meaning they can be worn in several different ways. Layer the leather jacket over a dress paired with the boots, or the graphic tee with high waisted shorts and the shoulder bag in the summer – the options are unlimited. 1.Leather Jacket: Madewell does it again with this moto jacket. I absolutely love mine. Everything from its shape to the quality of the leather, it is a must have piece. 2. Distressed Cropped Denim: I don’t have these in my wardrobe, yet. Key word, yet, because I definitely need these. However they are by one of my favorite brands that are quality and super comfortable. Also, the perfect high waist. 3. Snakeskin Heeled Bootie: Animal prints are everywhere this season and I am not even the slightest upset about it and these booties are a fun statement yet neutral piece to add to the wardrobe. 4. Chain Earrings: Perfect for a simplistic everyday earring that still has that stylish edge! 5. Chain Necklace: Because the earrings are too good that you have to have the necklace too; great for casual looks, especially graphic tees. I love that it is silver and gold so you can easily mix your metals and not feel guilty about it. 6. Red Studded Shoulder Bag: I love a good red bag and this one is top of the charts when it comes to affordability. Seriously, such a steal on the price for a fun statement bag! 7. Amour Tee: Because you want to support Valentine’s Day but you’re cooler than that so you get a tee that says love in a different language 😉 Also, you can never go wrong with a graphic tee. So maybe the casual edgy girl isn’t your style, it is okay, no hurt feelings here. Lets say you are the girl that is working the 9-5 and you have a dinner with a good looking someone at 6, which means you don’t have time to go home and get changed, but just enough time to freshen up in the car; this means your outfit has to be ready to go, no worries, I’ve got you. Here is a way to keep your look work wear appropriate while not arriving to the restaurant in a pant suit and not wearing a skirt that gives off the wrong signals because its Valentine’s Day, this is the look for you. 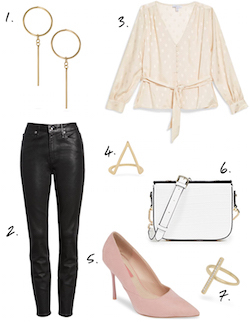 A simple polka dot blush top, paired with waxed denim, a pink pump, gold accessories, and a white cross body bag and girl everyone is going to be wondering where you work at and what special someone gets to be your lucky dinner date. 1.Circle Dangle Earrings: Uncommon James just gets me when it comes to jewelry. Simplistic yet unique and perfect for mixing and matching with everything in the wardrobe. 2.Faux Leather Denim Pants: They sound weird, but I can’t tell you how often these things have saved me when I needed my look to be a little bit more elevated but not over the top; not to mention they are so comfortable! 3. Blush Polka Dot Blouse: The sweetest top for the day of love. A gorgeous blush color with a slight pattern. This top is also great for the gals with an hourglass figure to really accentuate that waist of yours! 4.Pointed Ring: I love this ring and I love that you can wear multiple of them. Again, great for everyday wear or paired with a dress and heels. 5.Pink Pointed Heel: I love a good pump, and a pink one at that. This shoe is giving me all the Elle Woods vibes, like I am a strong powerful woman and can do anything I set my mind too. 6.White Croc Crossbody: Hold up, let me just clarify that this is not real croc! Loving the white croc pattern and how the white gives the look an overall added pop! 7. Diamond Rectangle Ring: Because one ring is truly never enough right? So if you are not into the edgy girl, the working girl, then who are you? Wait, I am totally kidding because style is broken up into WAY more categories than just three. In fact, personal style can’t always fit in a category! You’ve been told dinner reservations are at 7, meaning you need to dress up a bit more because you’re headed to a nicer restaurant and it is later at night, but it is February and if you live in a colder climate, this is the outfit for you. 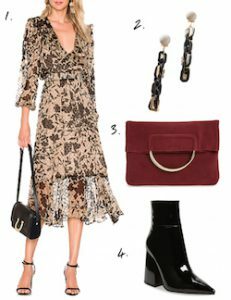 Throw on this neutral and black midi dress, a black heeled bootie, statement earring, and a pop of red in a clutch and you are good to go. Ready to celebrate and never have you looked better. 1.Vintage Floral Midi Dress: I love the vintage floral touch to this dress. Wear it dressy with items pictured or even wear it casual with white leather sneakers! How cute! 2.Statement Black and Gold Chain Earrings: Such a fun statement earring that really plays off the vintage vibe of the dress. An earring that is a statement but not over the top for this look. 3.Deep Red Clutch: Get your pop of red with the clutch, which gives you all the Valentine’s Day vibes! Love the gold accent of the handles. 4.Patent Leather Heeled Bootie: The ultimate black bootie with a perfect pointed toe, block heel, and oh so versatile. Wishing each of you a wonderful start to February. May you not only celebrate the love that you have for those around you on one day, but the whole month and year!